The P100CAN includes a total of 24×4 PPI I/O lines. and 7 solenoid drivers. A CAN controller(SJA1000) supports up to 1M-bit per second. The P100CAN allows TERN controllers directly connect to CAN-bus. All registers of the CAN controller are software accessible. 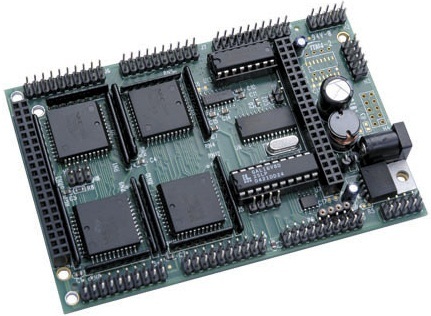 The P100CAN includes four PPI (82C55) chips, providing a total of 24×4 programmable bi-directional TTL I/O lines. There are 7 high voltage sinking drivers(ULN2003A) providing up to 50V, 350 mA each. A CAN controller(SJA1000, 20 MHz clock) with on-board transceiver supports up to 1M-bit per second speed. CAN interrupt and software programmable hardware reset are available. It allows TERN controller directly connect to CAN-bus. All registers of the CAN controller are software accessible. Two channels of RS-232 drivers and a 5V linear regulator are on-board. An optional RS232 or RS485 driver can be installed for the 3rd UART. The P100CAN requires 8.5V to 12V DC power supply with linear regulator, or up to 30V DC power input with an optional switching regulator without generating excessive heat. 5V switching regulator, RS-232 or RS-485 drivers. 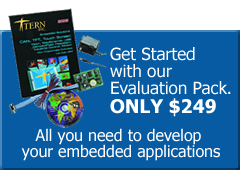 Includes: 2 RS-232 ports, 24 PPI I/Os, solenoid drivers, linear regulator. Driven by a 586-Engine, or AE86..